Schematic of the steps for incivility detection. The yellow colored blocks represent inputs, the red colored blocks represent the classifiers and the blue colored blocks represent the intermediate steps. Credit: Maity et al. 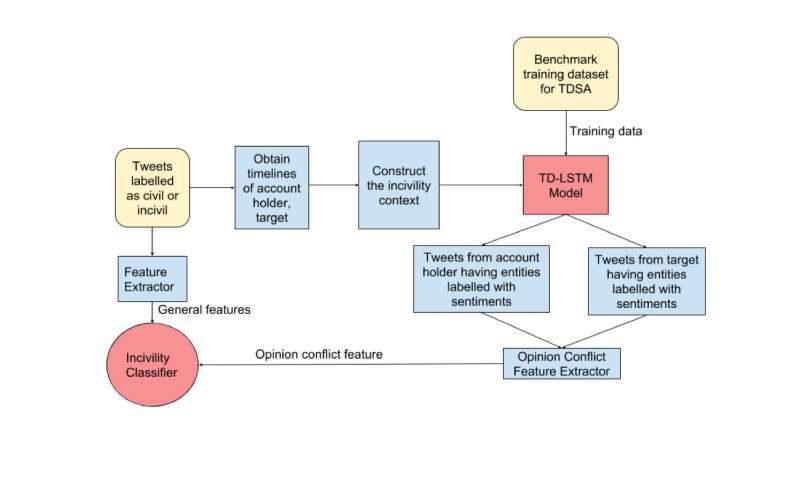 Researchers at Northwestern University, McGill University, and the Indian Institute of Technology Kharagpur have recently developed a character level convolutional neural network (CNN) model that could help to detect abusive posts on Twitter. This model was found to outperform several baseline methods, achieving an accuracy of 93.3 percent. In recent years, abusive behavior on online platforms has been rising exponentially, particularly on Twitter. Social media companies are hence seeking effective new methods to identify this behavior in order to intervene and prevent it from causing serious harm. "Twitter, which was initially conceived as an 'e-town square,' is turning into a mosh pit," Animesh Mukherjee, one of the researchers who carried out the study, told Tech Xplore. "A rising number of cyber-aggression, cyberbullying and incivility cases are being reported every day, many of which severely affect users. In fact, this is one of the main reasons why Twitter is losing its active follower base." Online content can spread rapidly and reach very wide audiences, so cases of online abuse often drag on for long periods of time with highly detrimental effects. The victim or victims, as well as other sensitive bystanders, might end up reading the offender's words countless times before these finally disappear from Twitter. This is why it is important for social media platforms to detect this content effectively and rapidly, performing timely interventions to remove it. "We set out with the objective to develop a mechanism that can automatically detect uncivil tweets early, before they can make severe damage," Mukherjee said. "We observed that most often, a victim/target is attacked after expressing strong sentiments toward certain named entities. This led us to the central idea of leveraging opinion conflicts to detect uncivil tweets." Mukherjee and his colleagues realized that abusive posts are often correlated with opinion differences between the offender and the target, particularly opinions about a renowned public figure or entity. They hence incorporated entity-specific sentiment information into their CNN model, hoping this would improve its performance in detecting abusive content. In the example of incivility context cited below, we observe that the target tweets positively about Donald Trump and US Economy. However, the offender (account holder) tweets negatively about Trump and positively about President Obama. We can observe that there is a conflict of opinion between the target and the account holder as the sentiments expressed toward the common named entity Donald Trump is opposite. Going through the entire exchange of messages, we find that this opinion conflict eventually leads to an uncivil post. Credit: Maity et al. "The character level CNN tries to automatically extract patterns from uncivil tweets that distinguish them from other tweets," Pawan Goyal, another researcher who carried out the study, told Tech Xplore. "We also chose to use character-level embedding, rather than word-level embedding. As tweets are usually small, only contain a few words, and have a lot of spelling variations, character-level models are found to be more robust than word-level models." This character level CNN model outperformed the best baseline method by 4.9 percent, achieving an accuracy of 93.3 percent in detecting uncivil tweets. The researchers also carried out a post-hoc analysis, taking a closer look at behavioral aspects of offenders and victims on Twitter, hoping to better understand incivility incidents. This analysis revealed that a sizable portion of users were repeated offenders who had harassed targets over 10 times. Similarly, some targets had been been harassed by different offenders on a several different occasions. "The most interesting finding of this study is that opinion conflicts strongly correlate with uncivil behavior on Twitter," Mukherjee said. "This single feature tied with the char-CNN-based deep neural model can be very effective in identifying uncivil tweets early." In the future, the CNN model devised by Mukherjee and his colleagues could help to counteract and reduce abusive content on Twitter. The researchers are now trying to develop similar models to detect hate speech on Twitter, as well as on other social media platforms. "Meanwhile, we are also studying how hate speech spreads on social media, as well as investigating how different methods of countering hate speech could help to tackle this vicious online phenomena," Mukherjee said. Cvility is the same as compacency, is the same as comfortablenss, and that is on the books, multiple times over, as being the thing that brings about a decline in intelligence. Ie, a perfect society is a dead society a purpose built commodity of dead things, zombies, in fact and reality. It is the stressing that makes for human growth and change. conformity and civility, n the end, kills. It makes living things dead and controllable, as a commodity. Beware too much conformity or forcing into it. A number of questions come to mind. Who gets to decide where the line between civil and uncivil is drawn? Will the line move as people adapt to the machine moderators/censors? Will Intelligent insults buried in subtext leak through the system as less articulate but sincere people are sanctioned? Will emotional and strongly held views be silenced more than safely civil ones? Do we really want machines intervening in human communication? 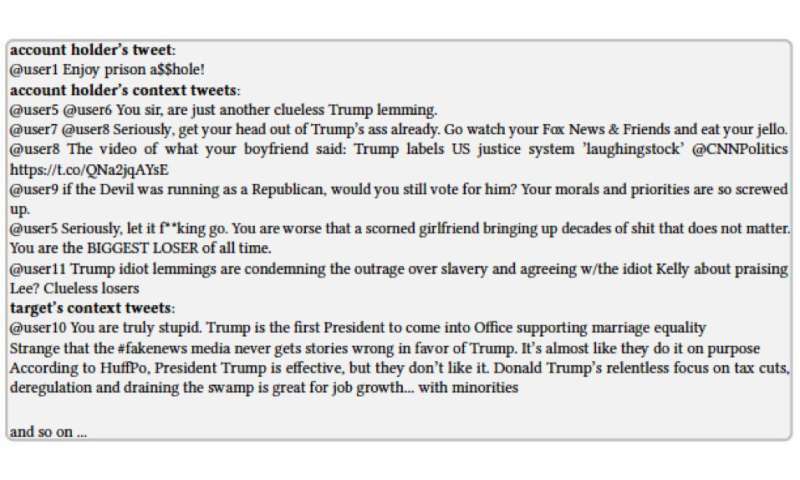 One wonders whether calling a large proportion of the American people "deplorable" be considered abusive behavior in this model? Please, cyber police, please save me from wrong think!